Barney Frank favors casinos in Massachusetts. 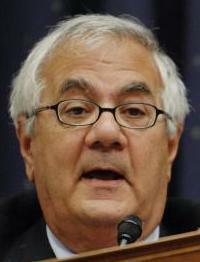 Barney Frank does not play poker or blackjack. The games bore him, and he thinks he would be terrible at them even if he tried. He's never played a slot machine, doesn't go to casinos, and has never tried to gamble online. "I wouldn't place a bet with your money," he said. And yet, over the past year, the Democratic congressman from Newton has quietly become a cult hero for poker players and the online gambling industry - the pit boss of poker politics - by championing their cause on Capitol Hill. Showing their appreciation, professional card sharks poured thousands of dollars into his campaign during a fund-raiser at the home of a gambling lobbyist. Since January 2007, he has received $48,300 from poker interests, making up about 7 percent of his individual contributions, according to public records. More than any other lawmaker, Frank is cited by online gamblers as their standard-bearer. In his powerful position as chairman of the House Financial Services Committee, he has proposed legislation that would legalize their industry, which has a shadowy image and is constantly under fire by the US Department of Justice. "God bless Barney Frank," someone posted on the online poker forum Two Plus Two. "A deity might be a good word to use," said Dan Cypra, media relations director for PokerSourceOnline.com. Websites aimed at online gamblers have started posting videos of Frank from C-SPAN. Recent donors to his campaign account include a pit boss at the Bellagio Hotel and Casino in Las Vegas, and a professional player named Chris Moneymaker. In October, 10 of the country's top professional poker players held a fund-raiser in Washington for Frank. They included Annie Duke ("The Duchess Of Poker"), Howard Lederer ("The Professor"), and Andy Bloch ("The Rock"). Frank said he didn't remember where the fund-raiser was held. But Robert Raben, a former Frank staffer from 1993 to 1999 who is now a lobbyist, confirmed it was held at his home. Among his clients is the Interactive Gaming Council, a group that includes some of the biggest online gambling companies in the world. Internet gambling in the United States was estimated to be a $5.9 billion industry, with about 8 million Americans wagering, according to a study done in 2005 by Christiansen Capital Advisors, a Maine-based research firm. But online gambling, which allows users to provide credit card numbers to play cyberbingo and real-time poker from their homes, has been controversial since the first Internet casino went live in 1995. A 47-year-old federal law prohibits betting using telephone lines, which the US Department of Justice has interpreted as prohibiting all online gambling, although most of the sites are operated offshore and do not fall under US laws. In 2006, President Bush signed a law that bars banks and credit card companies from making payments to online gambling websites, making it more difficult to place bets. Several businesses were exempted from the law, including online lotteries, fantasy sports, and horse racing. But poker was not, and online gamblers, joined by banks and lenders who did not want to police the industry, began mounting a lobbying blitz to counteract the law. Frank, who in January 2007 took over as chairman of the committee that regulates banking, had a powerful perch to champion the issue. Within four months of assuming the chairmanship, he introduced legislation that would reverse the ban that Bush signed and set up a regulatory framework to allow gamblers and poker players to play online. Frank, who also favors casino development in Massachusetts, said in an interview that his stance on gambling is rooted in his views about the proper limits on government intervention in people's personal decisions. If people want to gamble in the privacy of their homes, he said, they should be allowed. He said he reread John Stuart Mill's "On Liberty" before filing his legislation that would block the 2006 law. "If it affects me, mind your own business," he said. "If affects others, let the government get involved." Frank's legislation caught the attention of poker players and online gamblers, a group composed mostly of middle-aged, white men with laptops who were loosely organizing with a group called the Poker Players Alliance, which now says it has more than 1 million members. "This is not initially a very politically active group," Frank said. "The overlap between the Poker Players Alliance and the League of Women Voters is not very high." One of Frank's efforts fell short last month with the defeat of an amendment that would have prohibited the federal government from implementing regulations related to the ban. The measure was also backed by US Representative Ron Paul, the former Republican presidential candidate from Texas. After the amendment failed in a tie committee vote, 32 to 32, Frank posted an entry on the liberal website The Huffington Post that criticized Republicans, saying they let the religious conservatives guide their party on moral grounds instead of listening to free market ideas pushed by banks and financial institutions. Frank and other advocates view last month's defeat as a bump in the road, and are hopeful that the issue will come up again this year. Meanwhile, the alliance between Frank and the poker players is continuing to create strange bedfellows. To help their cause, the alliance has hired Alfonse D'Amato - a conservative Republican from New York who was a US senator from 1981 to 1999 and was nicknamed "Senator Pothole" - who has effusive praise for Frank. "He's a powerful, well-respected member of the Congress," said D'Amato, who is a poker player and was at Frank's October fund-raiser. "That is important. He has been able to get members to look at this issue. No one has been able to do that." And it's a bit striking for many in the poker and online gambling industries to embrace a liberal, Jewish, gay congressman. "I've become so entrenched in supporting a cause advanced by Barney Frank," said John Pappas, executive director of the Poker Players Alliance and a Republican who twice voted for Bush. "I never thought I'd see the day."